Robert Rufino was in town a few days ago as part of a SCAD Style panel discussion, and I'm so disappointed that I was under the weather and couldn't attend. 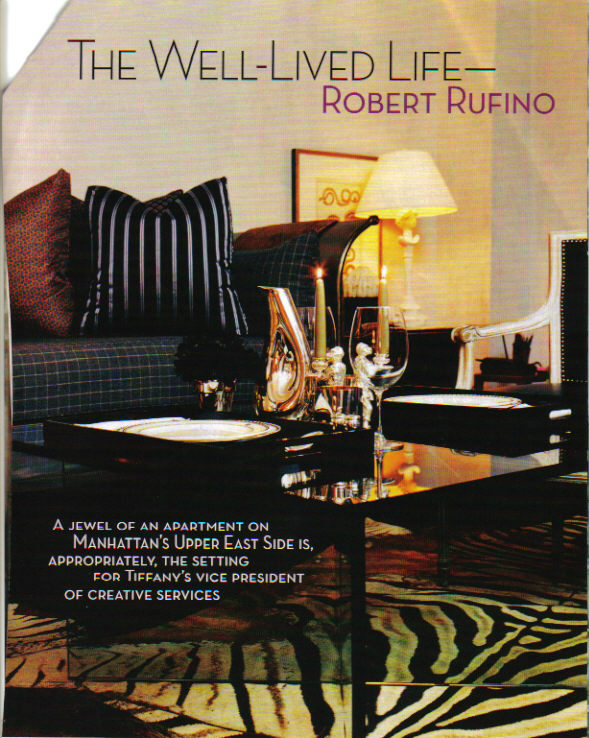 His appearance did, however, remind me of that great House & Garden article in which Rufino's small but supremely stylish Manhattan apartment was featured. 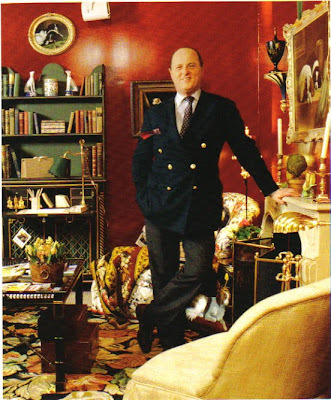 Of course, the most memorable part of his home were the beautiful menswear fabrics used, hardly surprising as Rufino has been named to the International Best-Dressed List on more than one occasion. Everyone's favorite Bamboo flatware. Thank goodness that someone in my family (my sister) has Bamboo, especially since it's a pattern that has been put out to pasture. I have also always loved the Peretti thumbprint cups and that Teardrop carafe (both still available, thank the Lord), but didn't purchase them while I had my employee discount- dumb move on my part. See those monkey candlesticks? I never knew we sold those until I saw this article. Maybe monkeys aren't big sellers here in Atlanta. 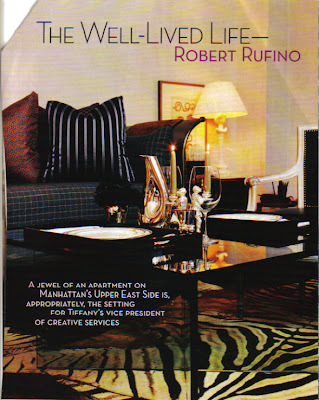 I was lucky enough to receive two Peretti orchid pots as gifts, one in black (like Rufino's) and one in cream. They're some of the most handsome orchid pots I've ever seen, but for whatever reason those got discontinued too. I better take good care of mine. A better view of that carafe. 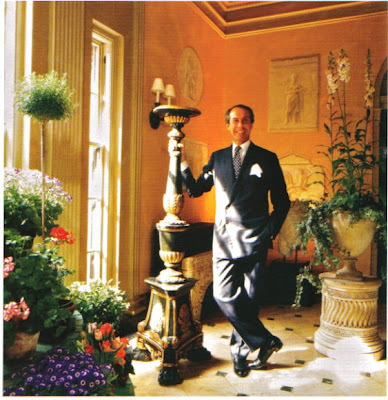 And another classic Tiffany piece is that sterling flower pot that Rufino employed as a vase. 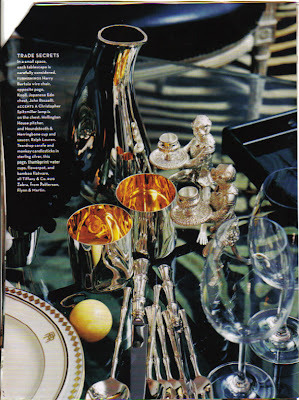 That simple decanter is none other than that designed by Van Day Truex for Baccarat. Now this decanter has been on my wish list for years. Had I known who Van Day Truex was at 22, I would have snapped one up in a heartbeat- meager salary be damned! 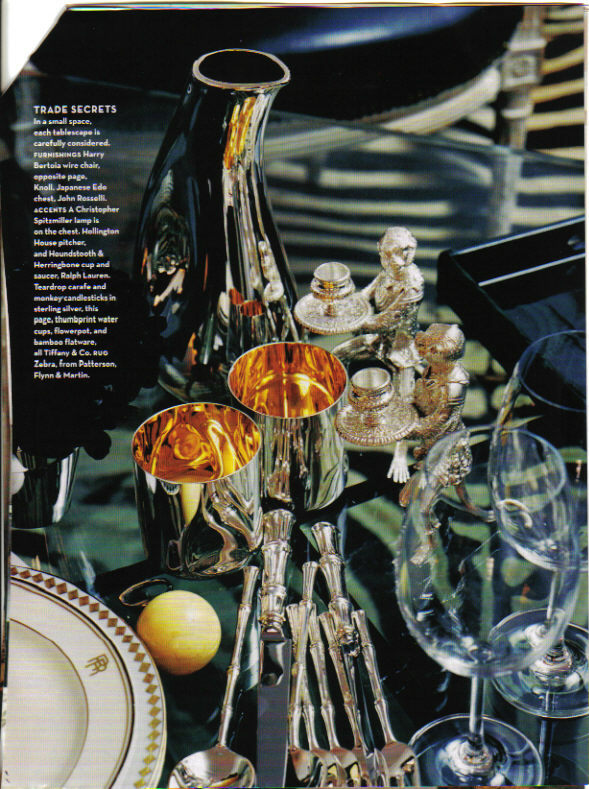 And that the crystal ice bucket is from Tiffany as well. So the moral of the story is...if any of you work at a shop or showroom, take advantage of that employee discount! Don't go broke, but use it while you can! Labels: Robert Rufino, Tiffany and Co. I've been called an "old soul" on more than one occasion. And I suppose that it doesn't come as a shock to me. After all, my favorite movies are those from the 1930s and 40s, something which I write about on a semi-frequent basis. And how many thirtysomethings do you know who spend their free time researching decorators like Elsie Sloan Farley, someone whose heyday was eighty some odd years ago? 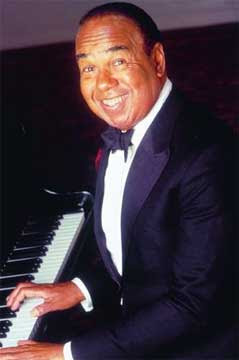 I was listening to Bobby Short as a teenager- and that's automatic old soul status right there. 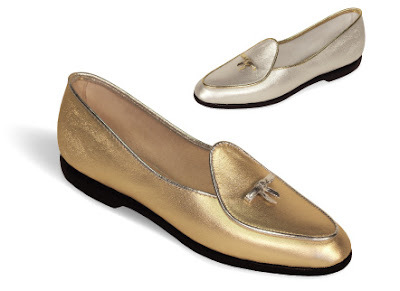 I have- and wear- Belgian Loafers. Seriously? 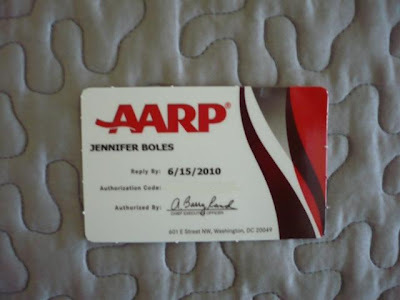 An AARP card? Belgian Loafers aside, I'm not that old. What's next? Geritol? Perhaps I should rename my blog: The Chic Has Peaked! 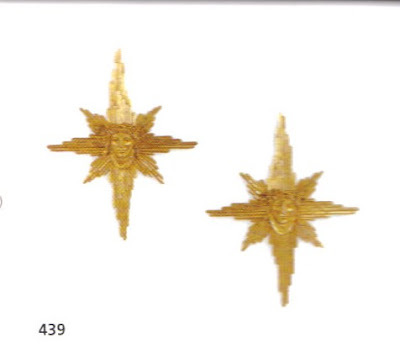 A lot of people feel that the sunburst mirror has been done to death, and I don't necessarily disagree. Yes, they're a tad ubiquitous right now, and perhaps if I had one I might give it a rest in storage for a while. 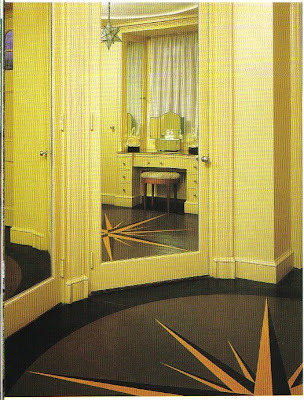 But just because the sunburst mirror is on a few "out" lists right now, it doesn't mean that the motif itself is stale. 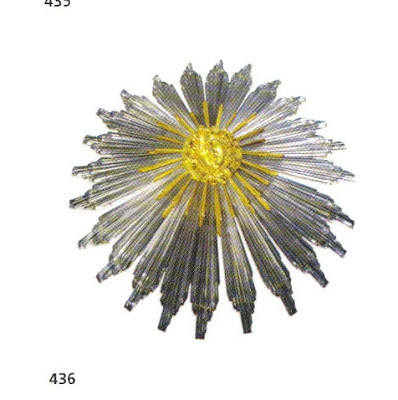 That radiating design is so pleasing to the eye that it would be a shame to throw the baby out with the bathwater. 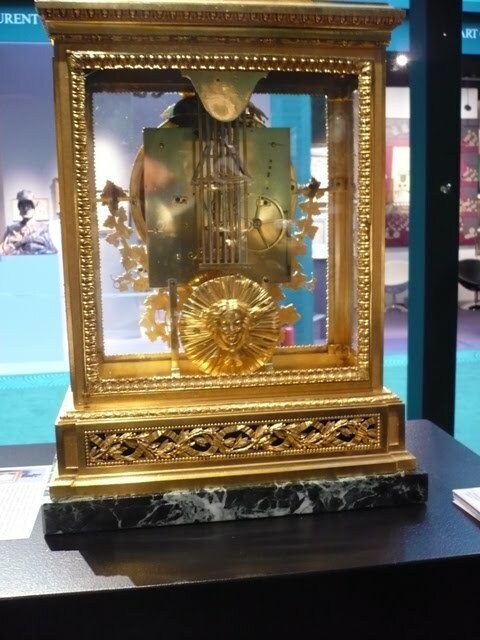 I mean, you wouldn't deem the mantel clock at top to be passe just because the pendulum is graced with that sunburst face. And let's face it, Elsie de Wolfe's Schiaparelli cape, below, is drop-dead chic, don't you think? A French ormolu and glass plaffonier-form chandelier. Now this is drama for your ceiling. But nobody, and I mean nobody, did sunbursts like Tony Duquette. I guess you could call him the Sun King! and on torcheres at Dawnridge. I'm dying (seriously, dying!) to use linoleum somewhere in my condo. But first, let's get something straight. When I say linoleum, I do not mean that cheap vinyl stuff that graced the kitchen floor of your first post-college apartment. I want honest to goodness linoleum. And, I want to have the linoleum cut to create an interesting pattern. If you look at old photos from the 1930s and 40s, you'll find the greatest linoleum floors in all kinds of colors and patterns. There were reds, grays, blues, and yellows. Greek key borders. 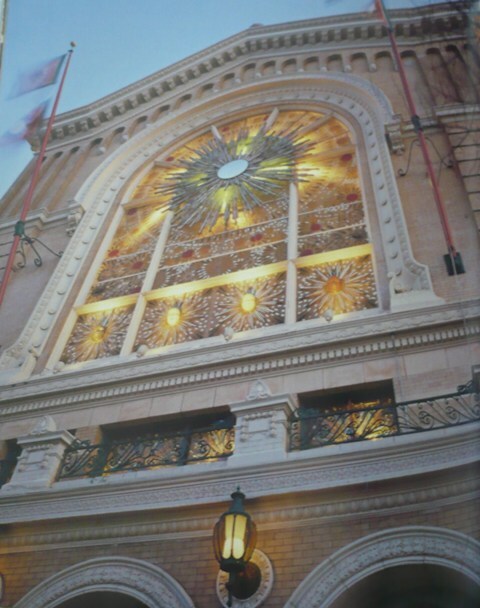 Inlaid stars. Geometric patterns. So where would my linoleum floor go? I've got two options: my entryway or my kitchen. Seeing that my entryway is small, perhaps that is where it will go. It would be a vast improvement over the ceramic tile that's there now. And I would probably go with a black and cream linoleum. You just can't beat those neutrals. And the design? Ah, that's the hard one to nail down. Now, if this was a really proper post, I would have researched all of the current offerings in the world of linoleum (Marmoleum, anyone? 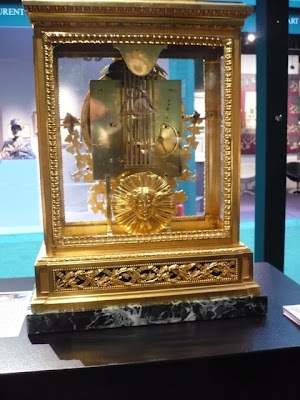 ), figured out how expensive a project like this might cost, and determined how difficult it would be to find someone who could actually execute it. But I didn't. 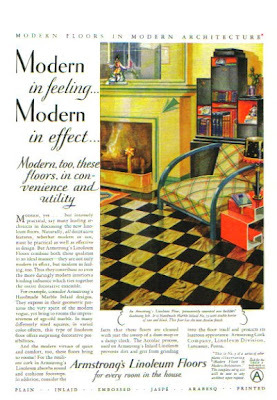 And that might be a good thing because I haven't found anything to dash my hopes to someday have my neat linoleum floor. 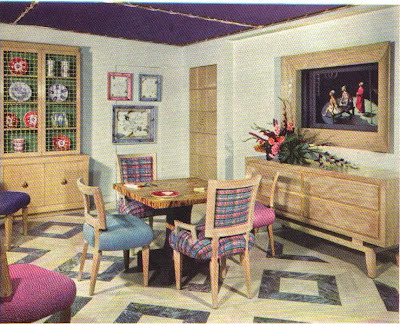 William Pahlmann decorated this model room for Lord & Taylor with a geometric linoleum floor. In the early 1940s, House & Garden suggested using all kinds of linoleum cutouts to create unusual floors, including this constellation design. 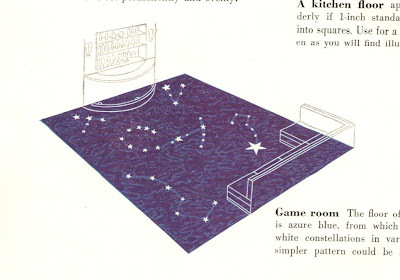 This would not be feasible today, but the constellation idea might be great for painted floors. I can't confirm if this floor is linoleum or some other kind of composite, but the simple outlined design might be an option for my entryway. I'm back from my trip and am completely jet lagged...and a bit sunburned too. I'm far too tired to post, but there is something that I want to share with you. For some silly reason I've been a little shy about discussing it with you. 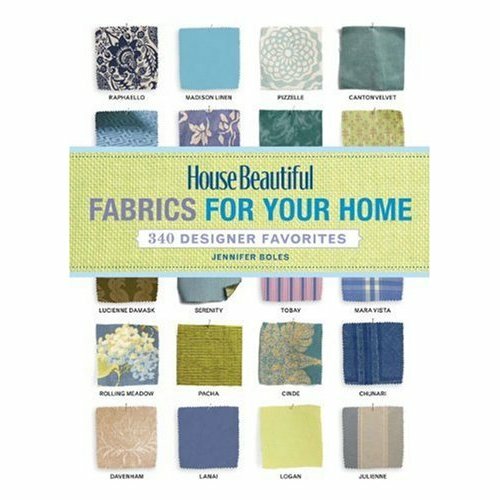 Last Spring I took a few weeks off from the blog to write and edit House Beautiful Fabrics for Your Home: 340 Designer Favorites . The book is a compilation of the magazine's Instant Room columns plus numerous photos featuring creative and striking uses of fabric. It's the kind of book that you'll want to throw in your bag when you hit the design center or fabric store. Think of it as "everything you wanted to know about fabric but were afraid to ask." I'm also going to participate in Washington Post writer Jura Koncius' popular online discussion Home Front tomorrow at 11am. I invite you to join in the live conversation about all things design. I'm off on a jaunt to a far-away destination: The Maldives. I guess that I need to brush up on my geography, because I didn't realize that I was heading half-way around the world. I'm loaded down with sunscreen, sarongs (because you know, I didn't have enough time to really hit the gym), and enough meds to open a pharmacy in the Indian Ocean. See you next week! Last week I posted about drinks tables...today, bars. And believe it or not, I'm really not a big drinker (I swear!) 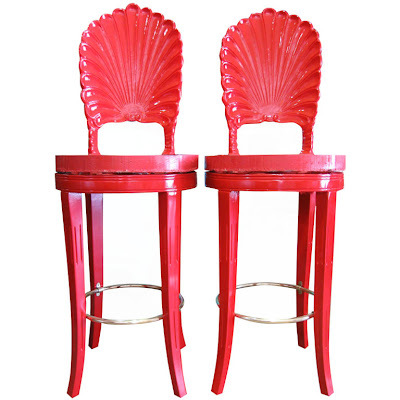 I think that the reason I tend to write about bars, bar carts, drinks trays, and the like is because all add a welcoming, hospitable note to one's home. 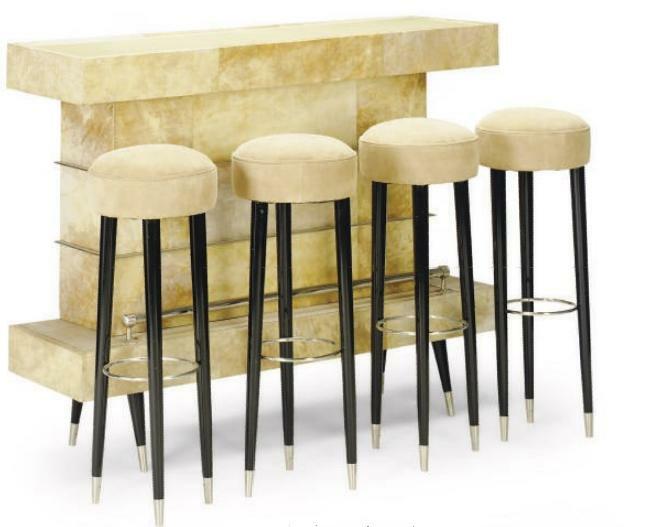 The bar featured above is a parchment bar with matching ebonized and suede stools that was part of last week's Interiors auction at Christie's. If you had the space for it, this would be pretty close to perfect. The parchment is reminiscent of 1920s and 30s cocktail culture-so swanky. 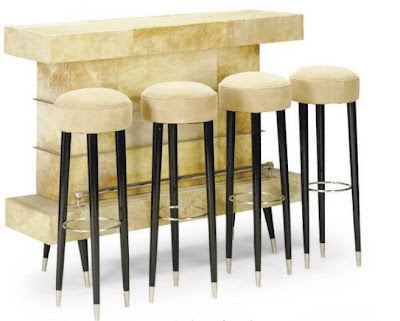 And of course if you had a bar like this in your home, you might have to rethink your house cocktail. I'd serve Manhattans, Gimlets, and of course Champers. I'd save the PBR, Boone's Farm, and wine coolers for the patio. 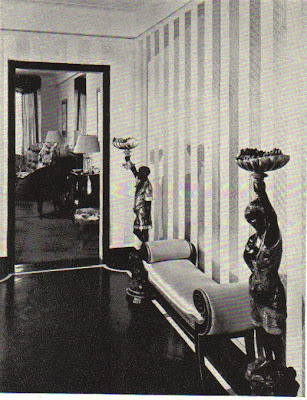 Back in 1929, House & Garden made their thoughts on Prohibition known by including a section on home bars in House and Garden Book of Color Schemes . "Since drinking has become a personal matter and assumed a secretive air, the private bar has sprung into existence." 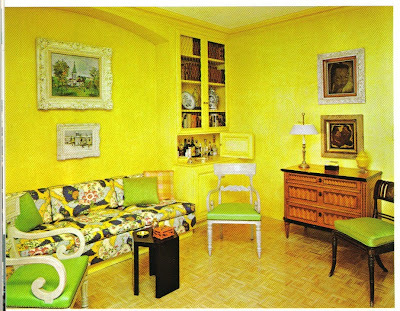 (The editors also believed Americans started to embrace color once Prohibition was passed- an interesting thought.) This Modernist bar, above, was designed by Magasin du Printemps. 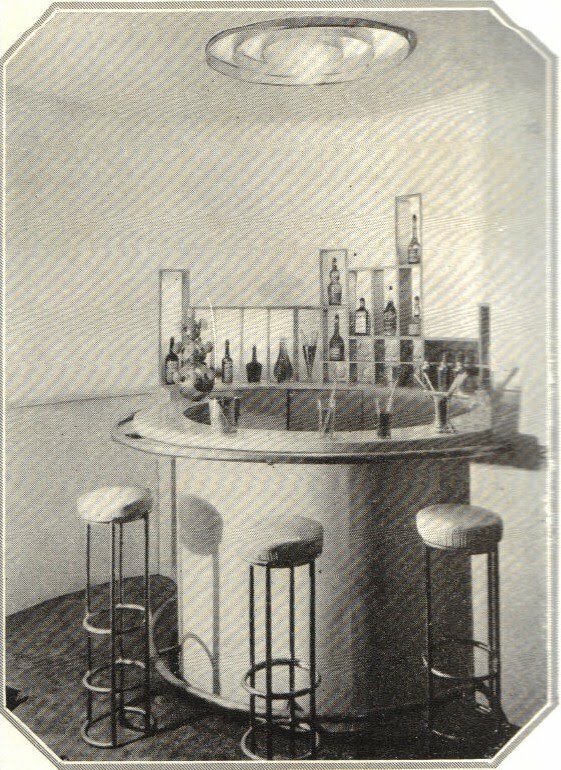 The bottle niches were backed in illuminated ground glass panels. 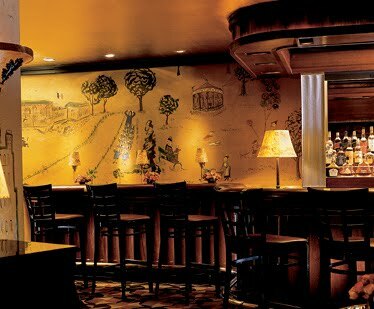 So if I had the space for a home bar, I'd probably have a mural painted around the bar area a la Bemelmans Bar. Oh sure you could get all serious and forgo the mural, but there's something about whimsy (tasteful whimsy, mind you) that just seems to go hand in hand with merriment of the liquid kind. 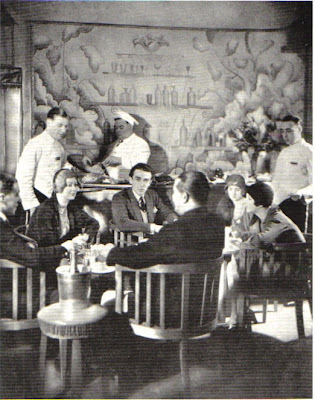 This mural from the 500 Club in London c. 1929 is another idea. Some of you might recognize the man in the middle as Brian Howard with Mrs. Plunket Greene next to him. 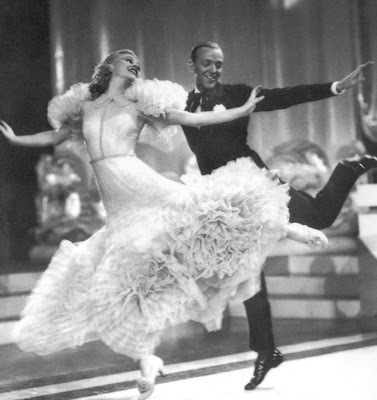 These two figures were part of London's Bright Young People during the Jazz Age. These people knew how to drink...amongst other things. 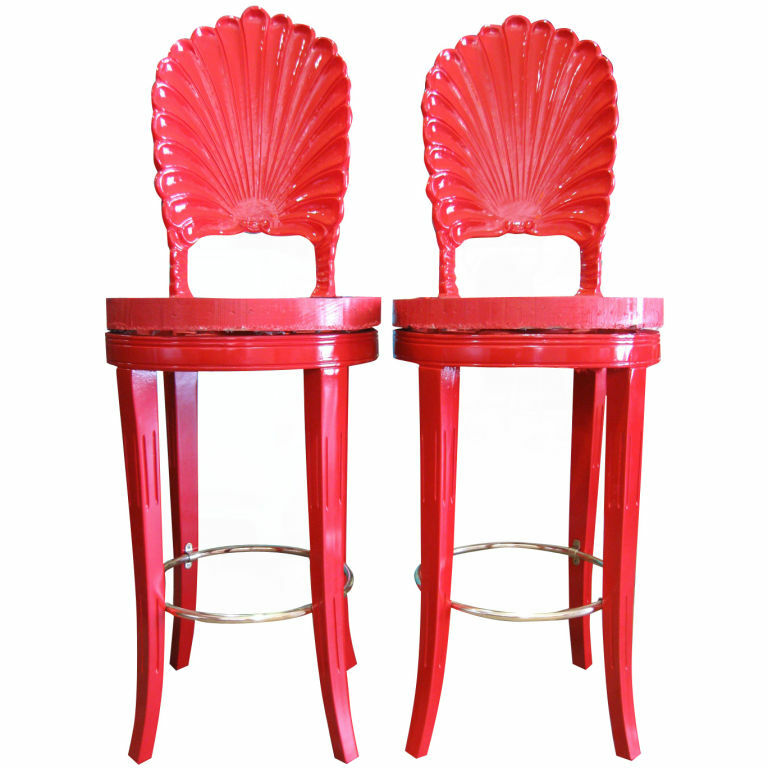 And I think I'd have to go with these bar stools from Penny Long. Certainly not vulgar, but not quite proper either. 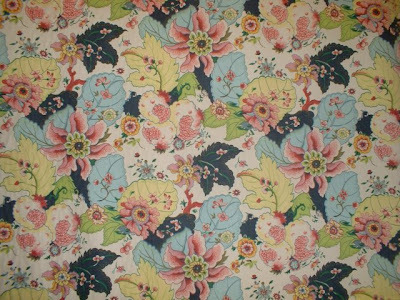 I admit that I don't know all of the whys and wherefores of chintz, but I do feel it's my civic duty to correct the misguided belief that all chintz is floral. 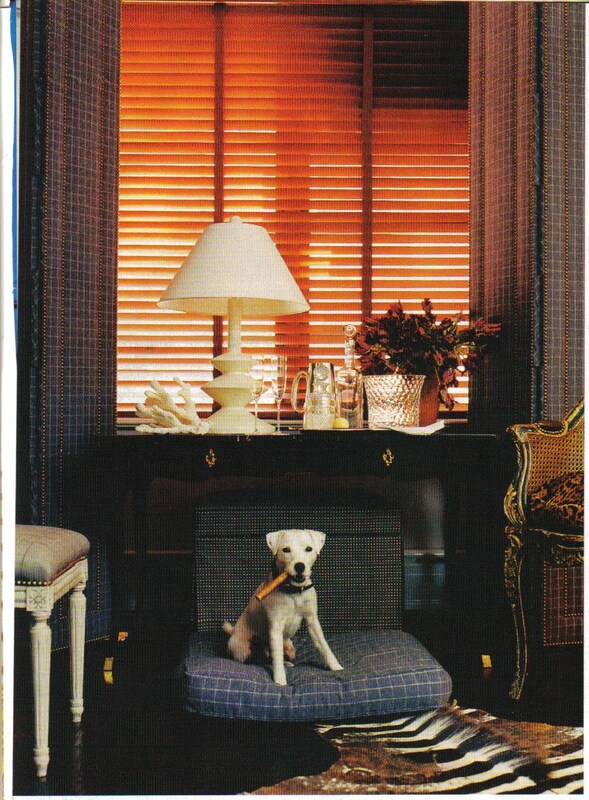 Chintz can take the guise of florals, Chinoiserie prints, stripes, or a myriad of other patterns. 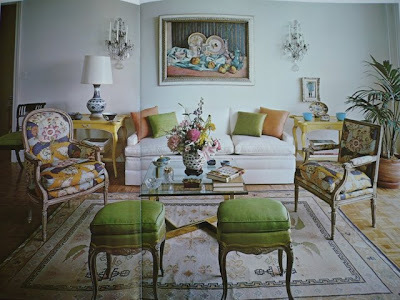 Truth be told, I'm not so crazy about floral chintz, but that's simply because I'm not really a floral print person. But there is one chintz that makes me giddy as a schoolgirl: tobacco leaf print glazed cotton. When I was young, we had a sofa in our library that was covered in a tobacco leaf chintz. My mother can't remember from which fabric house it came, but let me just say that it was mighty fine. The background was a clear, vibrant yellow against which the blues, purples, and gold of the tobacco leaf played their roles. Sure it was quite traditional- after all, the print is based on Chinese export tobacco leaf porcelain- but it also had Style with a capital "S". 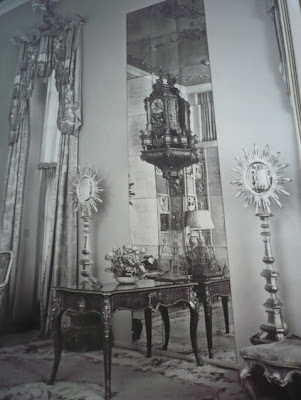 The only problem was that the fabric was a bit too delicate for a high traffic piece of furniture. Two daughters and a Springer Spaniel were a bit too much for the tobacco leaf. It started to look a little shabby a little too quickly, but you know, shabby is not so difficult to pull off. I was reminded of this fabric when I came across an old photo of the late designer Stephen Mallory's Rhinebeck, NY house. 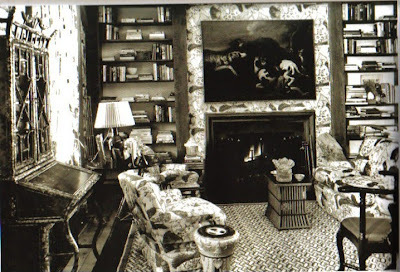 How disappointing that the photo is in black and white (see below), but just imagine the impact the fabric must have had when used on not just the sofa and armchairs but on the walls as well. I bet it was truly stunning in person. Oh, and it looks as though the upholstered pieces were quilted, something which seems to be making a comeback today. Unfortunately, I'm not sure if this particular print is still in production. I do know that Carleton Varney has a tobacco leaf print, but it doesn't have the rich yellow background like the one that I adore. 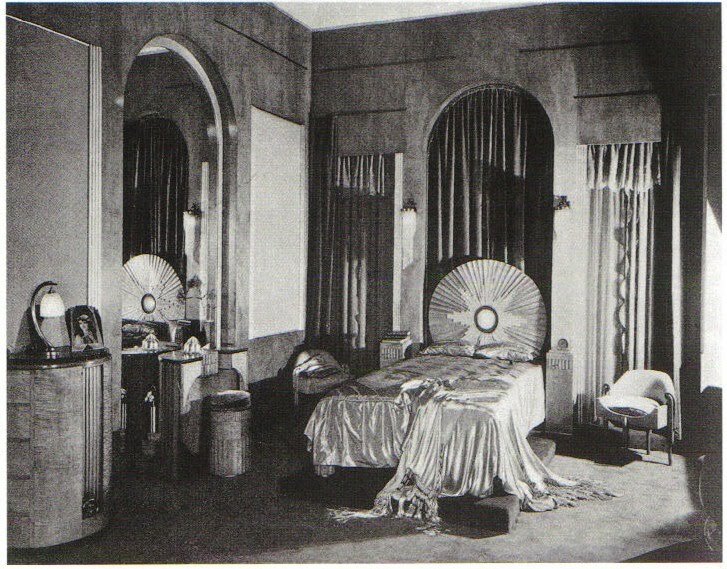 If I could find the fabric (and if I had an extra room lying around), I'd cover everything- walls, windows, and upholstered pieces- in the stuff. Now that would really be smoking. David Byers III used tobacco leaf chintz in the Plaza Towers unit of Mrs. Robert R. Snodgrass. 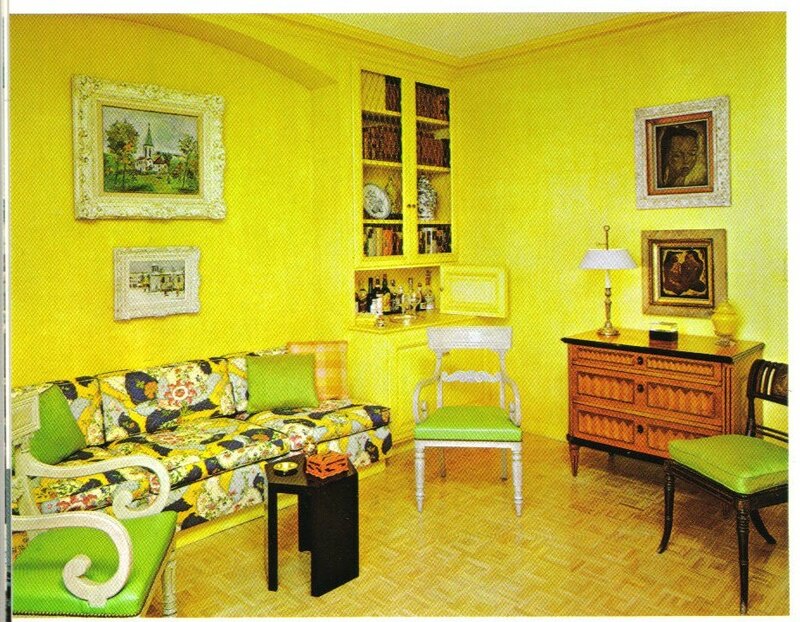 The print stands up well to the other yellows and acid greens used in the home. 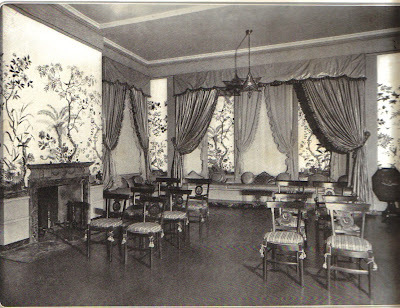 The photo at the top is the Music Room/Library, while the one directly above is Mrs. Snodgrass' Sitting Room. 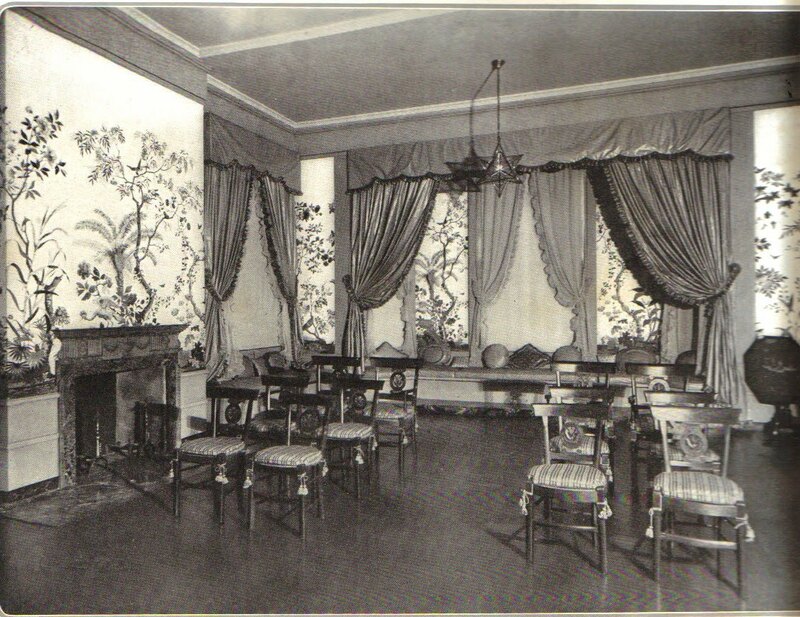 The late Stephen Mallory covered walls, sofa, and chairs in the chintz. It was not completely crazy...but it almost was. 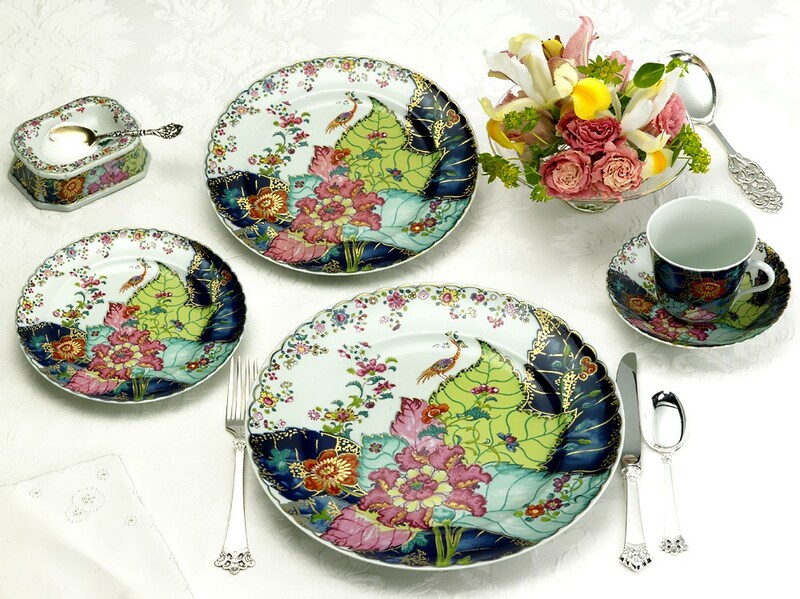 And of course, Mottahedeh's Tobacco Leaf china is a classic. What sparked your interest in design? Perhaps it wasn't a "what" but a "who". For me, I credit Dorothy Draper and her how-to guides. Who wouldn't want to become a decorator (or a design hanger-on) after reading those. There was also my parents' decorator. He was an old-school decorator who talked about his opera pumps and who reminisced about dancing with Wallis Warfield as a young man in Baltimore. 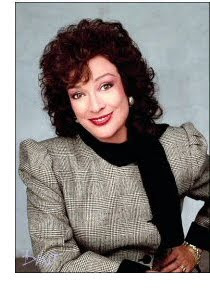 But there was also a bit of popular culture that helped to stoke my fascination with interior design, and that would be my all-time favorite TV show "Designing Women". When I learned yesterday that Dixie Carter, a.k.a. Julia Sugarbaker, had died, well, I felt like I lost a mentor. 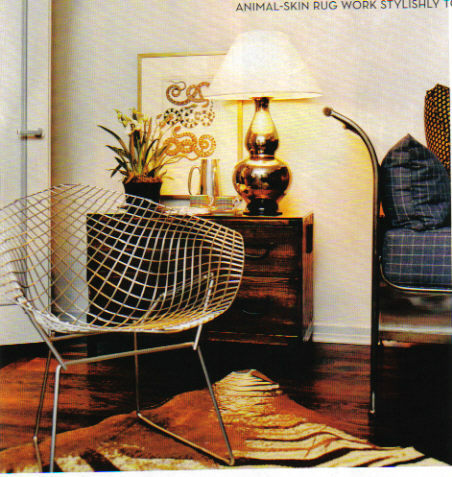 Oh sure, even back then I knew that Sugarbaker Design was not your typical design firm. First, and let's be honest here, their offices were really not well-decorated. Editing was, perhaps, not part of the Sugarbaker lexicon. 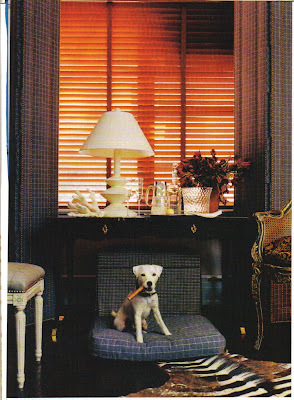 It was a mish-mash of "stuff", but the offices really weren't about antiques, bolts of fabrics, and random accessories. It was about the cast of characters. Of course, Julia Sugarbaker was the character many of us wanted to emulate. She could cut people off at the knees with her biting words, all delivered with that honeyed Southern accent (thanks to Carter's upbringing in Memphis) and a smile. Remember how she made mincemeat of Ray Don Simpson? It was something to aspire to, but something I've never been able to do. I just can't think on my feet that quickly. 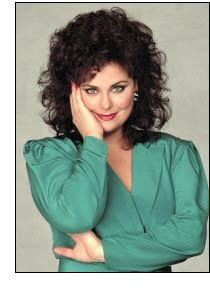 Then there was Suzanne, Delta Burke's man eating femme fatale. Oh yes, I wanted to be her too. In fact, to this day I still never leave the house without eyeliner on both the top and bottom lids. Suzanne taught me to do that; she had that dark hair and those bright blue eyes just like me, and that combination looks great with heavily (or in my case somewhat heavily) made up eyes. I mean, you just can't go out without your face on because if you do, you might miss your chance at meeting your own Dash Goff...or a really wealthy old man ready to kick the bucket. Mary Jo was not one of my favorite characters. 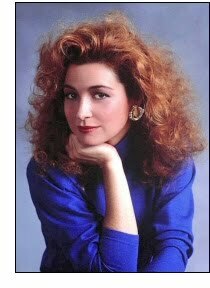 Yes, Annie Potts' character was cute as a button, but who wants to be that? 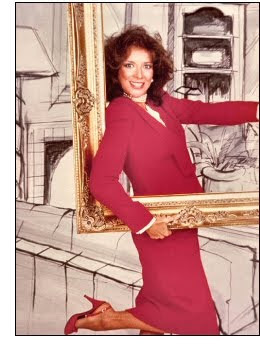 There just wasn't a lot of glamour there, but perhaps that's because she always wore those really low-heeled pumps. She was a little nerdy, a little awkward...and that's something that when it comes down to it most of us can identify with. And Charlene? Well, we all have our blonde moments no matter what color our hair is. She was brassy, just slightly rough around the edges, and had a heart of gold. I never quite got the whole Elvis fascination, but I share her nostalgia for the WWII era. So in honor of the late Dixie Carter and Julia Sugarbaker, I'm including one of Julia's most famous speeches- The Night The Lights Went Out in Georgia. Click the arrow above to see why we all admired her. 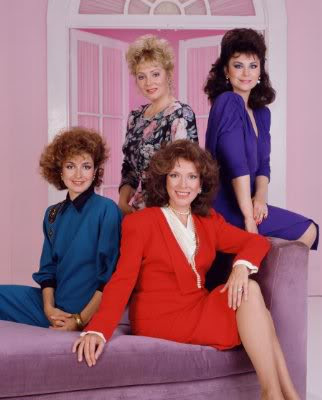 And now I'm gonna go fluff up my hair, paint my nails red, put on a jewel toned silk blouse replete with shoulder pads, and go knock someone down to size.